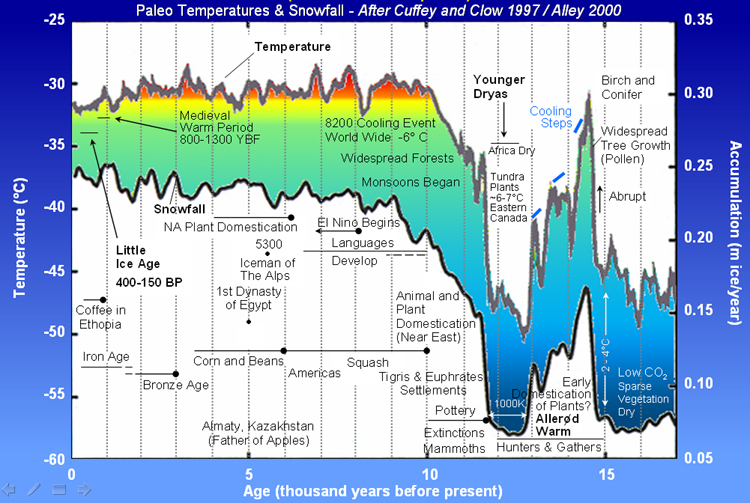 [C]hapter 2 [of the report,] “Arctic Climate: Past and Present” and, specifically, Section 2.7 “Arctic climate variability prior to 100 years BP” (pages 46 to 54) … documents the climate changes in the region from 2 million years ago up to the recent past. * Glaciers started to retreat around 1850 but between 1880 and 1890 there were glacier advances. In the early 20th century, glacier recession continued, with interruptions by some periods of advance. The most rapid glacial retreat took place between the 1920s and 1940s. “There is a bit of press covering a just-published paper that concludes that the current climate and ecological conditions in a remote lake along the north shore of Canada’s Baffin Island are unique within the past 200,000 years—and anthropogenic global warming is the root cause. Which of course, spells t-r-o-u-b-l-e.
“Global warming will leave the Arctic Ocean ice-free during the summer within 20 years, raising sea levels and harming wildlife such as seals and polar bears, a leading British polar scientist said on Thursday. “Most of the proxy data does not show anything unusual about the 20th century. But two data series have reappeared over and over that do have a hockey stick shape. One was the flawed bristlecone data that the National Academy of Sciences panel said should not be used, so the studies using it can be set aside. The second was a tree ring curve from the Yamal Peninsula in Siberia, compiled by UK scientist Keith Briffa. But an even more disquieting discovery soon came to light. Steve searched a paleoclimate data archive to see if there were other tree ring cores from at or near the Yamal site that could have been used to increase the sample size. He quickly found a large set of 34 up-to-date core samples, taken from living trees in Yamal by none other than Schweingruber himself! Had these been added to Briffa’s small group the 20th century would simply be flat. It would appear completely unexceptional compared to the rest of the millennium [see graph]. “Scientists say it’s a natural process — in one period the cold waters will have the upper hand, and in the next it’s the other way round. But the rapidly increasing temperatures of the subtropical oceans suggest that the balance could be tilted beyond natural variability, [Woods Hole Oceanographic Institute scientist Ruth] Curry says. To many scientists, however, the shifts in ocean currents are no cause for celebration. Even if there’s natural variability, there’s concern that global warming may make the fluctuations more extreme. And while some species thrive in warmer water, others that live on the edge of the Arctic, such as polar bears and seals, find their habitat melting away. “We’re heading off to a climate extreme and this is just going to snowball,” says Curry, reflecting on the state of the global climate on the Greenpeace icebreaker hosting the Woods Hole research team. “I don’t know what to do with this rubbish paper. It’s so damn bad that people won’t believe it, yet it’s deliberately constructed in a way to make the whole thing difficult to fix. The only way I can see would be to publish a dozen papers showing non-hockey stick graphs from similar data. These would be ignored and fought back with the claim that we had chosen the wrong proxies, yet the only difference would be we had not deliberately chosen hockey stick proxies. I propose new global policy on data handling and safety. Under my plan, the ever functional UN government would form an independently funded arm called – The Data Rights and Safe Treatment Commission (DRaSTiC) to protect innocent data from confessing under extreme duress created by scientific torture. In similar fashion to the IPCC it should be founded on three principles. 2 – If the data get’s tortured, was the torture caused by man and is it dangerous to the data’s conclusion. 3 – If problems are found, how can we mitigate the problem to create a safer world for innocent data.